The Possessió d’Alfàbia is one of Mallorca’s great historic estates. The property is said to go back to a Moorish alquería and the 11th century when an Islamic Virrey, Ben-Abet, settled there on account of the discovery of an immensely abundant source of water. The house and its splendid gardens are listed as a Bien de Interés Cultural and as such enjoy Heritage protection. I suppose that most visitors visit Alfàbia for its gardens but, the house itself is well worth a closer look as well. There is little left of the Islamic period: the property was extensively rebuilt after the Reconquista during the 13th century and again, during the 18th and 19th century. One main element still remaining from the Moorish period is a large coffered Mudéjar ceiling, said to be unique in Mallorca. The coffered ceiling is the work of Almohad craftsmen, built in 1170. It is carved in pine and holm-oak, with inlays forming beautiful arabesques. On the lower part the coats-of-arms of the Moorish families who lived on the estate are carved, and next to those, the emblems of Ben-Abet. 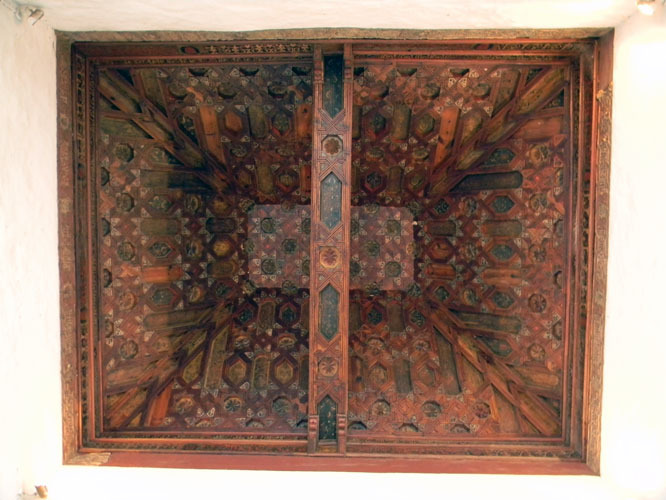 There are other large Artesonados Mudéjar (Moorish wooden ceilings) in Mallorca. Two of those in the possession of the town hall of Palma were sadly destroyed by a fire in a warehouse a few years ago. Beautiful Mudéjar ceilings can still be seen at the Palau de l’Almudaina in all their glory, and there is a large and very unique Mudéjar ceiling in the main house of the estate of Sa Bassa Blanca, the seat of the Fundació Jakober, near Alcúdia. Also, an impressive wooden Mudéjar ceiling can be found at the Palau del Rei Sanç in Valldemossa. The photo was taken near Bunyola, Mallorca, Baleares, Spain. The date: September 8th, 2011. The time was 16:39:07.